1. A representation or image of something. 2. Something which has a vague, tentative, or shadowy resemblance to something else. 1. To reproduce the essential features of something; such as, an aid to study or training: To practice for their drivers’ exams, students were using a computer to simulate various driving conditions and situations. 2. To feign, fake, or to pretend to experience something: Margie simulates pleasure even when someone disturbs her. 3. To mimic or to imitate someone or something: There are some homeowners who use devices that simulate the sounds of barking dogs in order to keep intruders away from their houses. 4. To create a representation or a model of a physical system or some particular action: Margaret bought a coat that simulatesthe the look and feel of real fur. Tom's neighbor has a wooden wall that simulates the appearance of stone. 5. 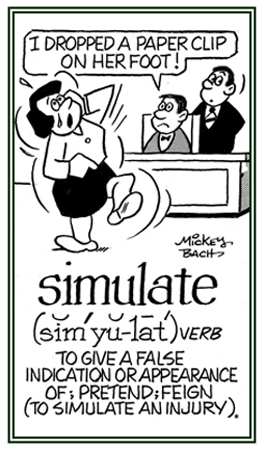 Etymology: from Latin simulatus, past participle of simulare "to make like, to imitate, to copy" from the stem of similis, "like, resembling, of the same kind". © ALL rights are reserved. 1. The reproduction of the essential features of something; such as, an aid to study or training. 2. The imitation or feigning of something or a false appearance. 3. The construction of a mathematical model to reproduce the characteristics of a phenomenon, system, or process, often using a computer. 4. A computer game which simulates or reproduces a real activity; such as, flying. 5. A broad collection of methods used to study and to analyze the behavior and performance of actual or theoretical systems. 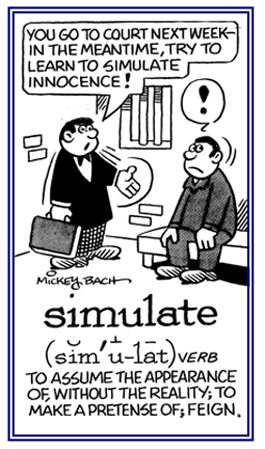 Simulation studies are performed, not with a real-world system, but on a (usually computer-based) model of the system created for the purpose of studying certain system dynamics and characteristics. Translated: "Where there is no direct law, the opinion of the judge is to be taken, or references to be made to similar cases."